SOF News Update 20181116 – Exercise Clear Sky 2018 in Ukraine, making good coffee in bad places, Netflix’s Medal of Honor series, ELN in Venezuela, Kilcullen on war in the city (podcast), Zimmerman on Salafi-Jihadism, defense of Sweden, reduction of SOF in West Africa, Navy SEALs and MARSOC Marines charged with murder of Green Beret, SERE training, Trident Juncture and IO, SkyBridge Tactical, SEAL sexual assault case, and more. Good Coffee in Bad Places. Marty Skovlund spends some time with a Green Beret turned coffee entrepreneur to discuss ways of making good coffee in austere environments. Read “How to make good coffee in bad places, according to Evan Hafer”, Coffee or Die Magazine, November 2018. First Female Soldier Completes SFAS. A woman has completed the Special Forces Assessment and Selection (SFAS) course and has been selected to attend the Special Forces Qualification Course (SFQC). The qualification course is one to two years long depending on MOS and language. Read “A female soldier has made it through the Army’s Special Forces selection”, Army Times, November 15, 2018. SEALs Marines Charged with Murder of Green Beret. Two MARSOC Marines and Navy SEALs have been charged with murder in the death of a Green Beret in Mali in June 2017. Special Forces Staff Sergeant Logan Melgar discovered that the Marines and SEALs were stealing money from a fund meant for HUMINT operations. (The Daily Beast, November 15, 2018). SkyBridge Tactical Supports USSOCOM. A small firm – SkyBridge Tactical – founded by ex-Green Berets is fast becoming a vital player in USSOCOM’s small footprint operations. Read “SkyBridge Tactical supports US special operations from Africa to Syria”, Intelligence Online, November 15, 2018. SFQC Changes Are Coming. The Special Forces Qualification Course (SFQC) may soon be shortened to 24 weeks. Read more in “Changes Are Coming for the Special Forces Qualification Course”, Special Operations.com, November 2, 2018. ISR Contract for SOCOM Awarded. A company has been selected to provide operational support for ISR to SOCOM’s JCETII program worth $769 million. (Army Technology.com, Nov 14, 2018). Working with SERE Specialists. An Airman recently had the opportunity to train with Survival, Evasion, Resistance, and Escape specialists. Read more in “Dover Airman volunteers with SERE specialists”, 436th Airlift Wing Public Affairs – DVIDS, October 19, 2018. SEAL Sexual Assault Case. A Navy SEAL convicted years ago could be innocent. An investigation is underway to determine if a guilty verdict was illegally handed out due to unlawful command influence by top leaders in the Navy’s Judge Advocate General’s office. See “Top military court orders new investigation into SEAL’s sexual assault case”, Navy Times, November 15, 2018. Former Navy SEAL’s Story of Time in Iraq. Some of the most intense urban fighting in recent decades took place as the Iraqi Security Forces (and others) pushed the Islamic State out of western Mosul. A former Navy SEAL was there as a member of the Free Burma Rangers (FBR). Read his story in “How a Former Navy SEAL fought ISIS to preserve life in Iraq”, Coffee or Die Magazine, November 2018. DoD – Recruiting and Retention. The Fiscal Year 2018 end of year report on recruiting and retention have been published by the Department of Defense. Army accessions were at 91%, Navy 100%, Marines 100%, and Air Force 103%. Of the reserve components only the Marines met 1005 of recruiting goals. (DoD, Nov 15, 2018). Exercise Clear Sky 2018. USAF pararescue jumpers participated in an exercise with their counterparts in the western Ukraine in October. The exercise demonstrated the U.S. commitment to provide a response to Russia aggression in Ukraine and other areas of eastern Europe. In addition to the pararescue jumpers other USAF assets participated in the exercise to include MQ-9 Reapers, KC-135 tankers, F-15 fighters, and Ukrainian jets. Following the exercise the Ukrainian Air Force chief of staff visited his U.S. counterpart in the Pentagon to discuss the countries growing ties. See “US Air Force’s huge exercise in Ukraine fuels growing partnership and that country’s NATO ambitions”, Air Force Times, November 14, 2018. “Russia’s aggression is not simply a matter for Ukraine. It is a threat to the region, to Europe, to the United States and to the stability of the international order.” (AF CoS Gen Dave Goldfein). Sweden Concerned about Russia. Russia has been a growing concern for its neighbors in Scandinavia and the Baltics. Sweden is among those concerned nations. Last year it implemented a conscription for its military forces and it recently increased its defense budget by 11%. But will it join NATO? Read more – “In Sweden, conscription and a leaflet on how to prepare for war – just in case”, The Christian Science Monitor, November 15, 2018. Trident Juncture and IO. The recent NATO exercise held in Scandinavia provided the participants to expand upon their information operations capacity and capability. Read “Trident Juncture and the information environment”, NATO Review Magazine, November 16, 2018. NATO’s Moment of Reckoning. Anne Applebaum says that “military relations in the transatlantic alliance are humming. Yet an intangible but palpable crisis is shaking the foundations of NATO – and it has brought the organization to a moment of reckoning.” Read “The Black Hole at the Heart of NATO”, The Wilson Quarterly, Fall 2018. Force Optimization. DoD announced that it will reduce personnel operating in U.S. Africa Command’s AO about 10 percent. The emphasis in West Africa will shift from tactical assistance to advising, liaising, and sharing intelligence. This will likely mean a reduction of SOF in West Africa. Read “Pentagon Announces Force Optimization”, DoD, November 15, 2018. Turkey and ‘Expeditionary Imperialism’. According to Elizabeth Teoman Turkey has effectively annexed large portions of Northern Syria. Read “Turkey’s Near Abroad Expansion”, Institute for the Study of War, November 15, 2018. Countering Iran’s Global Terrorism. Nathan Sales, the State Department Ambassador-at-Large and Coordinator for Counterterrorism, recently addressed the Washington Institute for Near East Policy. The event took place in Washington, D.C. on November 13, 2018 during the institute’s “Counterterrorism Lecture Series”. Read a transcript of his remarks. ELN in Venezuela. Columbia’s National Liberation Army (Ejercito de Liberacion Nacional – ELN) is making significant inroads into Venezuela. It is expanding its criminal enterprise within Colombia’s neighboring country in the midst of social and political turmoil in Venezuela. Read “ELN Now Present in Half of Venezuela”, InSight Crime, November 13, 2018. Medal of Honor. The US Defense Department has been a big help to Netflix in the production of the docuseries celebrating Medal of Honor recipients by providing personnel, equipment, and other assistance. Read Bringing Medal of Honor Heroics to Life, by Katie Lange, US Department of Defense, November 13, 2018. Podcast – Kilcullen on War in the City. David Kilcullen, who some folks will remember as a guru of COIN practice and theory, chats with John Spencer of the Modern War Institute at West Point about how cities will be a dominant feature of the coming landscape of conflict and security. Listen to MWI Podcast: War Goes to the City, With David Kilcullen. (50 mins, Nov 14, 2018). Chopper Insert of Norwegian Troops. U.S. Marines with Marine Heavy Helicopter Squadron 366 insert Norwegian troops via air during Trident Juncture 18 at Vaernes Air Base, Norway on November 1, 2018. (video footage by Corporal Paige Stade, USMC). 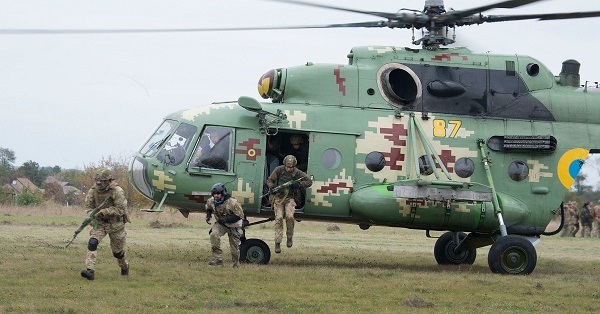 Photo: USAF pararescue jumpers train Ukrainian counterparts in western Ukraine as part of Clear Sky 2018. Photo by MSgt Joseph Prouse, USAF, Nov 2018.